During our Ecuador jungle trek we had part of a morning to visit the local shaman. While we were waiting for him to arrive, our guide took the opportunity to have a little fun with a local plant that has been traditionally for face painting. 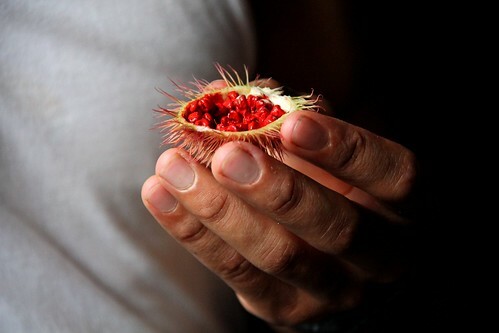 When ripe, the seeds inside of the flower pod are an amazingly bright red. Some local tribes use the coloring as face paint, others use it to color their hair. Justin was a good sport and agreed to have his face painted, and luckily he had no trouble washing it off at the end of the day.